what is your favorite episodes out of my favorites? It's snowing in the backyard. Austin enters through his fence door wearing a crown and a mantle and holding a scepter and introduces himself as "Prince Austin". He's not just a prince, he's the ruler of Snowland, where all the teddy bears, dolls and all of the other toys are praised and very happy. He sings, "Everyone's Happy in Snowland"
Andrew is in the backyard wearing a sash and holding a scepter. He introduces himself to the viewer that he's Emperor Andrew. He says he's not just an emperor, he also the leader of the royal monarchs. It's a rescue squad in which they rescue anyone in danger. He sings "We'll Rescue Anybody, Anywhere". The backyard transforms into a British land and a very large castle appears. The emperor (now wearing a black uniform, a gold crown, and a red mantle) arrives on his horse, Francis. 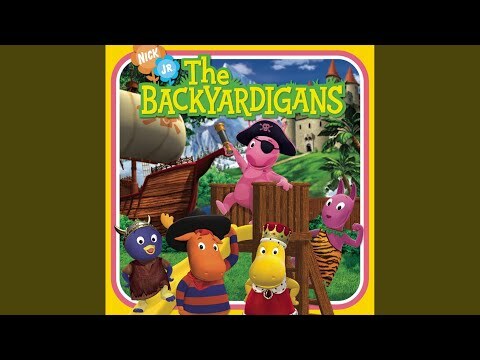 A blog for The Backyardigans Song Lyrics and Subbed Music Video Clips. How many characters are on the backyardigans? No Chance for a fifth season.